There are few places in the world as picturesque, luxurious and surprisingly affordable to tie the knot as Mexico. Whether you want to hold your ceremony on a cliff overlooking the ocean, in a jungle hideaway, on an island, or in a handsome colonial church, these 50 glamorous resorts will give you plenty of fodder to dream about. Please note this article was originally published in July 2016. For updated rates, please visit individual resort websites. Hotel description: Think pristine waters and white sand beaches, a vibrant nightlife, luxury accommodations and a free honeymoon package for those getting married at Beach Palace. There is one outdoor pool, two rooftop pools and 287 rooms at this resort. Location: Cancun, 25 minutes from the Cancun airport. Wedding information: Get married on the beach, on a terrace overlooking the ocean or in a ballroom. Wedding packages include: Compliments of Palace Resorts with a minimum three-night stay. Nautical: $1,500 USD; Romantic Red: $2,000 USD; Metallic Sands: $2,500 USD; Exotic Peacock: $3,000 USD; Pearl Shimmer: $3,500 USD; Lavender Luxe: $3,900 USD; Sultry Sunset: $4,200 USD; Pure: $4,500 USD. Hotel description: This is an 18+, couples-only destination, where you can get away from it all and enjoy the beauty around you. Enjoy a day at the spa, take in a romantic dinner and lounge on the sand. This hotel has 252 rooms and four pools, including three infinity pools. Location: Cancun, 25 minutes from Cancun airport. Wedding information: Get married on the beach, on a terrace overlooking the ocean or in a ballroom. Wedding packages include: Compliments of Palace Resorts with a minimum three-night stay; Nautical: $1,500 USD; Romantic Red: $2,000 USD; Metallic Sands: $2,500 USD; Exotic Peacock: $3,000 USD; Lavender Luxe: $3,900 USD; Sultry Sunset: $4,200 USD; Pure: $4,500 USD. Hotel description: This is an 18+ luxury resort, offering only the finest of the finest for its guests. Dine in one of its five à la carte restaurants, from Asian, French fusion, international, Italian, Mexican or steak house. There are also five bars at this location. Get your pre-wedding beauty sleep by choosing the right pillow on the hotel’s pillow menu. There are 260 rooms in this hotel and three pools. Wedding information: Get married on the beach, on a beautiful terrace, in a classic gazebo or in the ballroom. Wedding packages include: Complimentary wedding with a minimum four-night stay; Royale wedding: $1,499 USD; Zen Garden wedding: $2,799 USD; Signature wedding: $3,999 USD. Hotel description: Soak in the sun and the sand at this all-inclusive family resort. Bring your family and friends for a stunning wedding ceremony on location, or travel 15 minutes to the Parroquia de Nuestra Señora del Carmen church and get married in true Mexican style. There are 201 rooms at this resort and one outdoor pool with a swim-up bar and kid’s area. Location: Playacar, 60 minutes from the Cancun airport. Wedding information: Get married on the beach deck, on a terrace overlooking the ocean, in a solarium or in a ballroom. Wedding packages include: Compliments of Palace Resorts with a minimum three-night stay; Nautical: $1,500 USD; Romantic Red: $2,000 USD; Metallic Sands: $2,500 USD; Exotic Peacock: $3,000 USD; Lavender Luxe: $3,900 USD; Sultry Sunset: $4,200 USD; Pure: $4,500 USD. Hotel description: Located on the Yucatan Peninsula, this beachfront resort is the epitome of luxury and has the awards to prove it. You’ll set into a modern interpretation of Mayan architecture and you can stay in the resort or book a private villa. There are 274 rooms at this resort and two pools. Location: Cancun, about 15 minutes from the Cancun airport. Wedding information: Get married inside the hotel in one of their state-of-the-art conference rooms, or outdoors on the beach, by the pool or on the terrace. Hotel description: Situated on the tip of the Baja California Peninsula, The Resort At Pedregal is waiting to wash your cares away. Set into the cliffside, this 24-acre property offers ocean and mountain views in its rustic setting. There is an adult pool here, as well as a family pool and a kid’s pool. Wedding information: Get married on the beach, or on the lobby terrace or pool terrace. Food and beverage minimums start at $500 for two guests, up to $30,000 for 140 guests. The minister, music, flowers, catering, wedding cake, photographer and special entertainment are additional costs. Your reception can be held at one of four venues. Hotel description: Upscale and exotic describe this resort.There’s something for everyone at Cabo Villas Beach Resort & Spa, from a wide variety of activities, lounging by the pool, swimming in the ocean, relaxing at the spa, enjoying a delicious dinner and so much more. Wedding information: Get married on the beach, at the rooftop restaurant or in one of the penthouse suites. Packages start at $1,655 for up to 10 guests. Hotel description: Go golfing, lounge on the beach or poolside, take in a delicious dinner and enjoy the spa—luxury is at its finest here at the St. Regis. If you want to get outside the resort, call on one of the Pool Butlers to set up a snorkeling experience or make a reservation for an excursion. This resort has 120 rooms and 31 suites, and three infinity pools. Wedding information: Your special day can take place in the ballroom and on the terrace, or on the stunning beach. Hotel description: Yahoo Travel awarded Grand Velas Riviera Maya with the #1 all-inclusive resort award in 2015, and it’s easy to see why. The resort has been described as posh and contemporary, offering everything you could want in a luxury resort. Set on a stunning, white sand beach and only 10 minutes from downtown Playa del Carmen where you can take in the nightlife. Room service is available 24/7 and the high-end spa offers 42 treatment rooms and a number of ways you can wash your cares away. This resort has 539 rooms and an infinity pool with a poolside bar. Location: Playa del Carmen, 35 minutes from the Cancun airport. 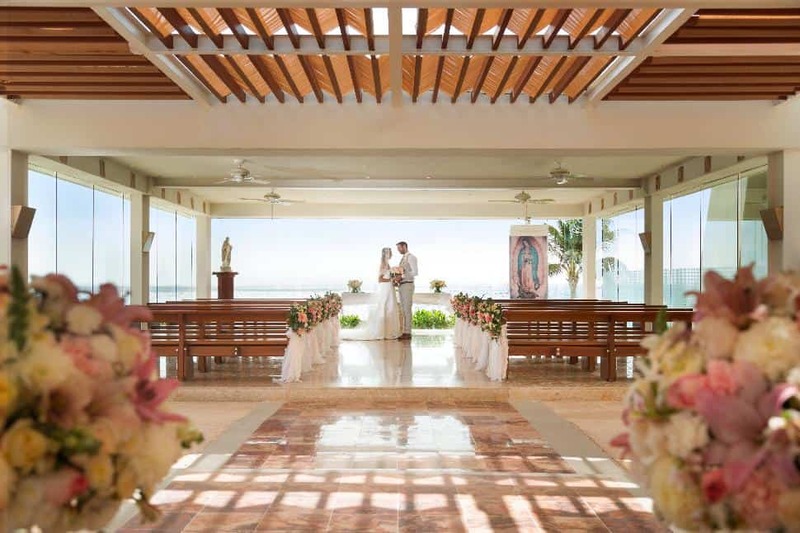 Wedding information: Grand Velas Riviera Maya offers several wedding venues – the Zen Garden, the pool terrace, the terrace of the Sen Lin restaurant, a chapel set in the jungle, the Ambassador Garden, an ocean-view terrace, on the beach or in the hotel’s convention centre. Hotel description: The Grand Fiesta Americana Los Cabos Golf & Spa was named in the top 10 of Golf Digest’s Top 50 Best Golf Hotels in the World. Come and play the one-and-only Cabo del Sol Golf Club, and when you’ve completed your round come back to the hotel for even more luxury. This all-inclusive hotel is fun for the whole family, with amazing beaches, cultural and recreational activities to enjoy, supreme cuisine and a wine spa – one of only seven wine spas in the world, and the only one in Mexico. This resort offers 526 rooms and six pools. Wedding information: Get married on the beach, on one of the stunning terraces, in the ballroom or in a private suite with access to its own garden, terrace and pool. Wedding packages range from $900 to $8,850 USD and the guest cost is about $250 USD per night. Hotel description: Watch your dreams come true in this adults-only, luxury boutique hotel. Situated on Fifth Avenue in Playa del Carmen, you won’t miss a moment of the action and you’ll be swept away by the sophistication and amenities at your fingertips. There are 60 rooms at this resort and one pool on the rooftop terrace. Wedding information: Get married on the rooftop terrace. With a 50-person maximum, packages range from $8,625 to $14,443.75 USD. This includes food and four hours of open bar, as well as a photographer and other accessories. Hotel description: Stay at this luxurious adults-only resort and you’ll be surrounded by the ocean and the tropical forests of the Sierra Madre, situated right in front of the Arches of Vallarta. Dine. Relax. Shop. Explore. You can do it all at the Grand Fiesta Americana Puerto Vallarta, and you can do it in style. There are 443 rooms at this resort, and two pools. Wedding information: Get married in a gazebo, at the Sky Bar or on a private beach. The pool terrace, Beach Club and ballroom are available for your reception. 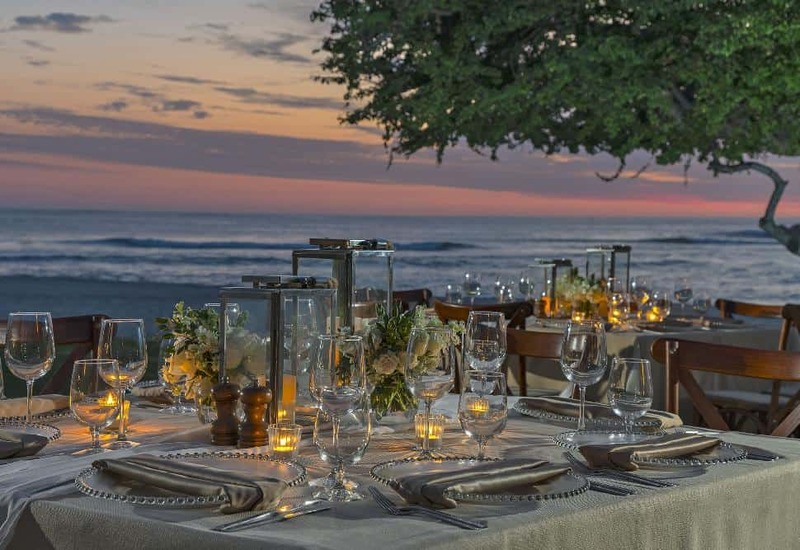 Costs range from a complimentary symbolic ceremony if you book five rooms for three nights, to $2,999 and $3,599 USD. 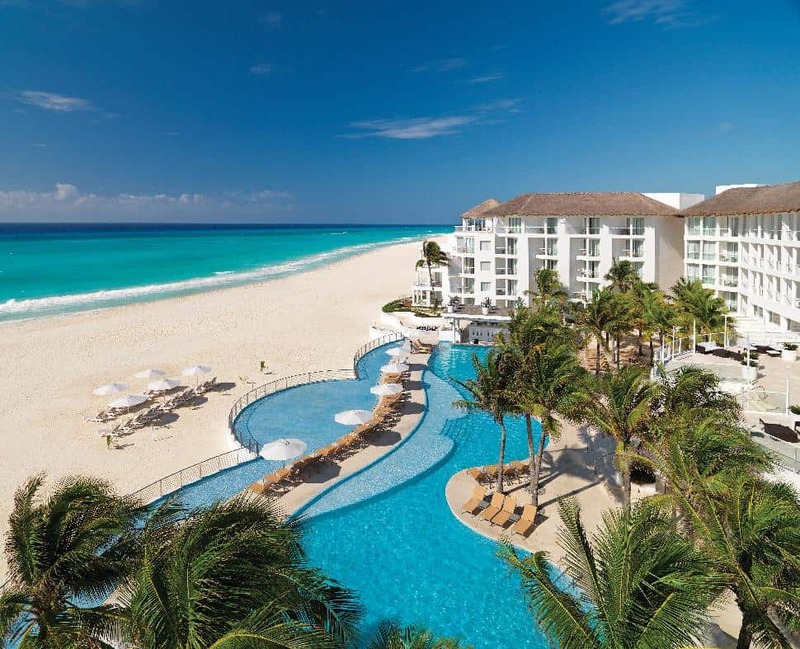 Hotel description: If luxury is what you’re after, you’ll find it at the Secrets Capri Riviera Cancun. This resort offers adult-only Unlimited-Luxury, and it’s their commitment to you to fulfill your every wish and desire while you’re on vacation. Gourmet food and drinks, 24-hour room and concierge service, pool and beach wait service, unlimited daytime and nighttime activities and entertainment – no wristbands required, all taxes and tips included. All you have to do is bring your suitcase and enjoy. There are 291 rooms at this resort, and one pool. Location: Riviera Maya, 45 minutes from the Cancun airport. 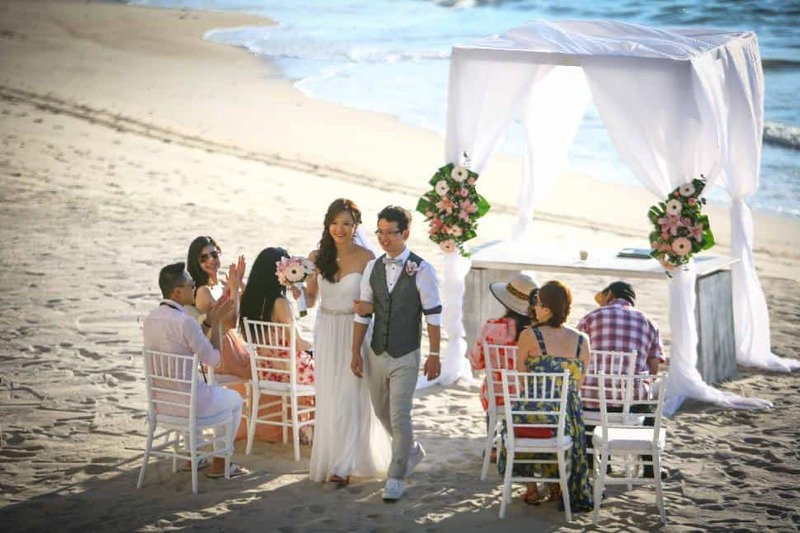 Wedding information: Get married on the beach or in an eye-catching gazebo, and then host your guests for a reception on the beach, in the ballroom or on the terrace. Wedding packages consist of complimentary when booking requirements are met (or $999 USD); the Secrets of Love package is $2,799 USD for 2016 and $3,199 USD for 2017, but receive $300 off the 2016 price or $400 off the 2017 price if booking between August and October; the Secrets Ultimate package is $3,299 USD for 2016 and $3,599 USD for 2017, but receive $300 off either price when booking between August and October. Hotel description: Welcome to one of the most pristine beaches in all of Mexico. If you’re looking for some adventure, relaxation and the ultimate in all-inclusive, you’ve come to the right place. This is an adult-only resort that offers its guests the best of the best. The Secrets Maroma Beach resort is Rainforest Alliance Certified, meaning the resort is committed to reducing its environmental impact within the resort and surrounding community. This is given to tourism businesses that adopt best management practices and meet specific criteria that are developed/endorsed by the Rainforest Alliance. There are 412 rooms at this resort, and an infinity pool. Location: Maroma Beach, 45 minutes from Cancun airport. 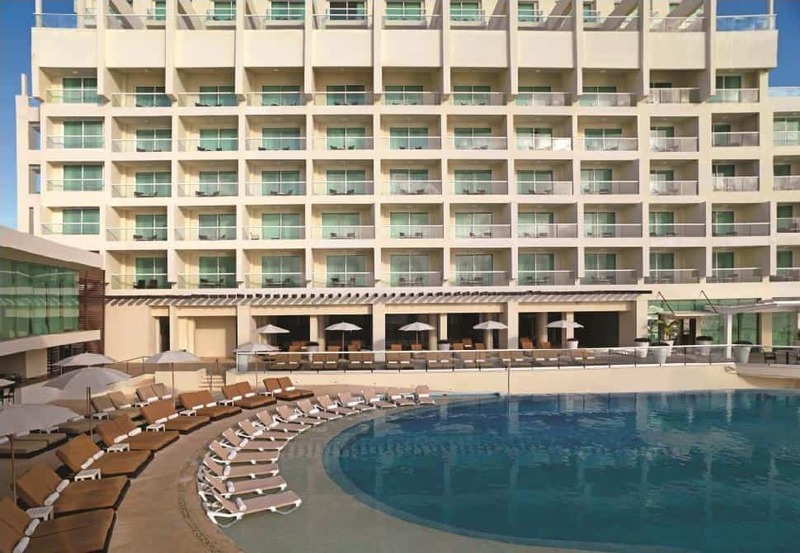 Hotel description: Located on Mexico’s beautiful Pacific coast, the family-friendly Sunscape Dorado Pacifico Ixtapa is an ideal place to experience Ixtapa, and you’ll love the stress-free experience. This beachfront resort is located near the heart of downtown and within walking distance to major attractions, such as swimming with dolphins, a water park and two golf courses. There are 285 rooms at this resort, and one pool with two waterslides. Wedding information: Get married on the beach in a gazebo, or choose another spot on the resort that might suit your needs. There are three packages to choose from: The Sun-Kissed wedding package costs $899 USD or is complimentary if the booking requirements are met. The Love In The Sun wedding package is $2,399 USD for 2016, or $2,199 USD if you book between August and October. For 2017, to cost will be $2,499 USD or $2,199 if you book between August and October. The Forever wedding package is $2,899 USD for 2016, or $2,599 USD if you book between August and October. For 2017, the cost will be $2,999 USD, or $2,699 USD if you book between August and October. Hotel description: Located on an island off the coast of Mexico’s Yucatan Peninsula, this resort is well known for bringing out the kid in everyone. Make vacation memories that will last a lifetime. Everything you will need for an affordable, stress-free vacation is included in the Unlimited-Fun package, including comfortable rooms and suites, delicious food, bottomless drinks, live entertainment and daily activities for every age and interest. There are 218 rooms offered at this resort, and two pools. Location: Cozumel, 20 minutes from the Cozumel airport. Hotel description: Situated on the tip of the Baja California Peninsula, between the desert dunes and ocean rock formations, this resort is a luxurious all-inclusive paradise for guests of all ages. 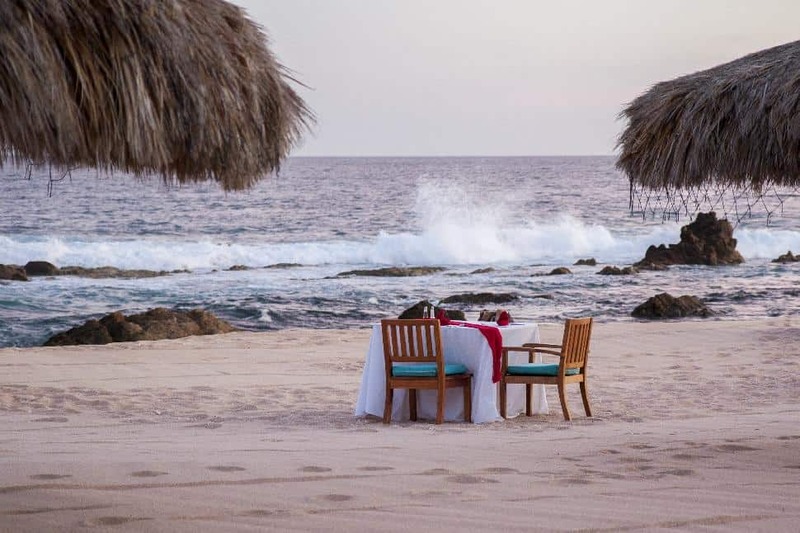 The resort offers spectacular views of the Sea of Cortez, dining opportunities at seven different restaurants, a stunning beach, all-inclusive activities and is only minutes from San José del Cabo. There are 591 rooms offered at this resort, and five pools, including a kid’s pool. Location: Five minutes from San Jose del Cabo and 20 minutes from the Los Cabos airport. Wedding information: Get married on the beach—in a classic white gazebo or right on the sand. Wedding packages range from complimentary, with a certain number of guests staying at the hotel, up to $11,150 USD. There are several packages to choose from, so you’re sure to find something that fits your needs and budget. 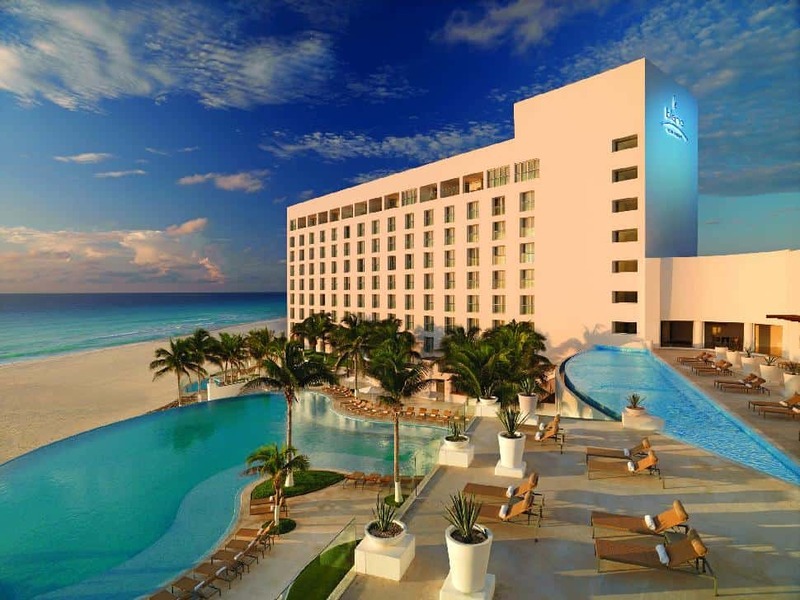 Hotel description: This beachfront, all-inclusive resort offers all the natural beauty you’d expect on the Mexican Riviera. This is a family-friendly experience you won’t soon forget. 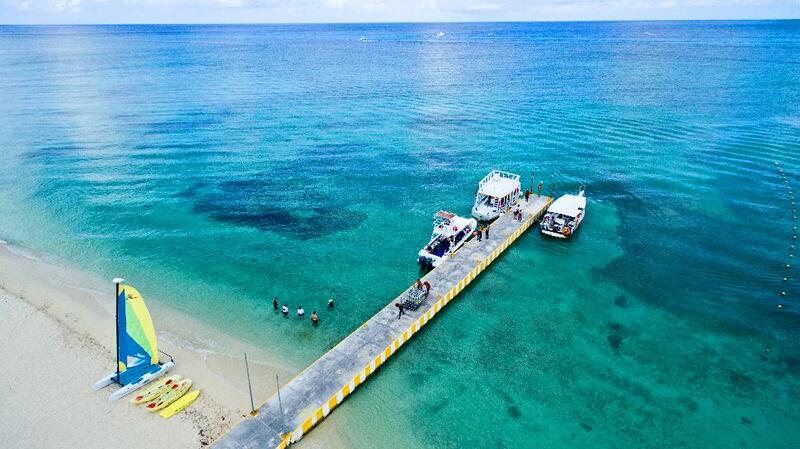 Thanks to the hotel’s location, you can snorkel and scuba dive in some of the best reefs in Cozumel. Be sure to try out the resort’s many other activities, and spend a night at the theatre to round out your stay. There are 294 rooms here, and one pool. Location: Cozumel, 30 minutes from the Cozumel airport. Wedding information: There are three packages available: $999 USD, $1,999 USD and $2,899 USD. 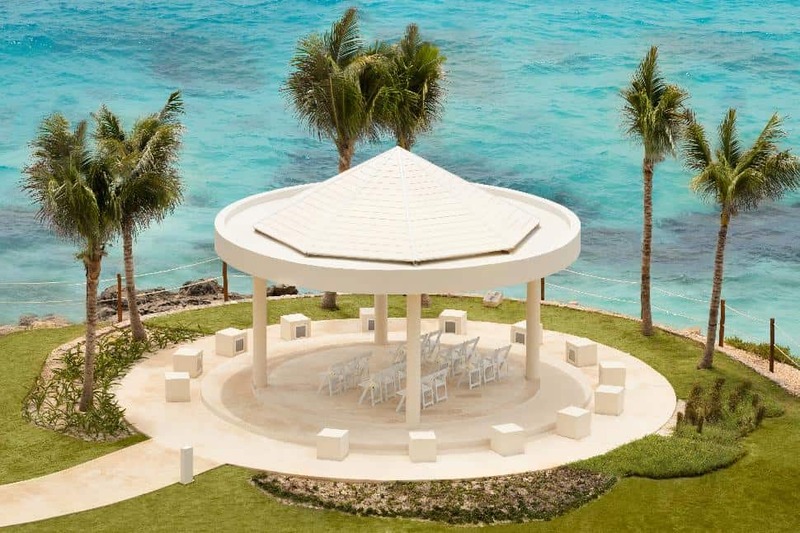 Find the perfect location at IBEROSTAR Cozumel and say your vows in style and luxury. Hotel description: The IBEROSTAR Quetzal hotel combines traditional Mayan influences with modern luxury and amenities. This all-inclusive resort is family friendly and only a few minutes away from beautiful beaches. Once you’re done lounging, be sure to spend time at the spa and take in a live performance. There are 350 rooms at this resort, and four pools. Location: Playacar, 60 minutes from the Cancun airport and five minutes from Playa del Carmen. Hotel description: This is a tropical paradise, and you’ll be treated to four white sand beaches and a private coral reef. Las Brisas is popular with couples seeking a romantic getaway, as well as with families looking for an ideal vacation spot. The hotel is set up to resemble a small village, divided into four different areas. Due to its size and the distribution of rooms and vegetation, this resort does not feel crowded even when there is a full house. There are 484 rooms here and three pools to enjoy. Location: Tangolunda Bay, 20 minutes from the Huatulco airport. Wedding information: Get married on the beach, in a stunning garden or on a terrace overlooking the ocean. The basic wedding package is $790 USD and goes up from there, depending on your wishes. 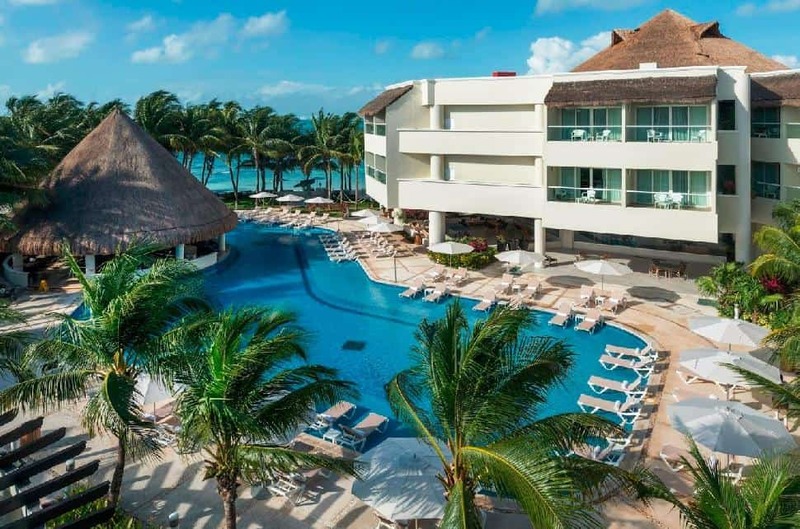 Hotel description: Set along a natural white-sand beach in the Riviera Maya, surrounded by lush tropical gardens and the crystal-clear Caribbean, Dreams Riviera Cancun Resort & Spa is a luxurious oasis for couples and couples with children. There are 486 rooms at this resort, and four pools. Location: Puerto Morelos, 30 minutes from the Cancun airport. Wedding information: There are three wedding packages available. 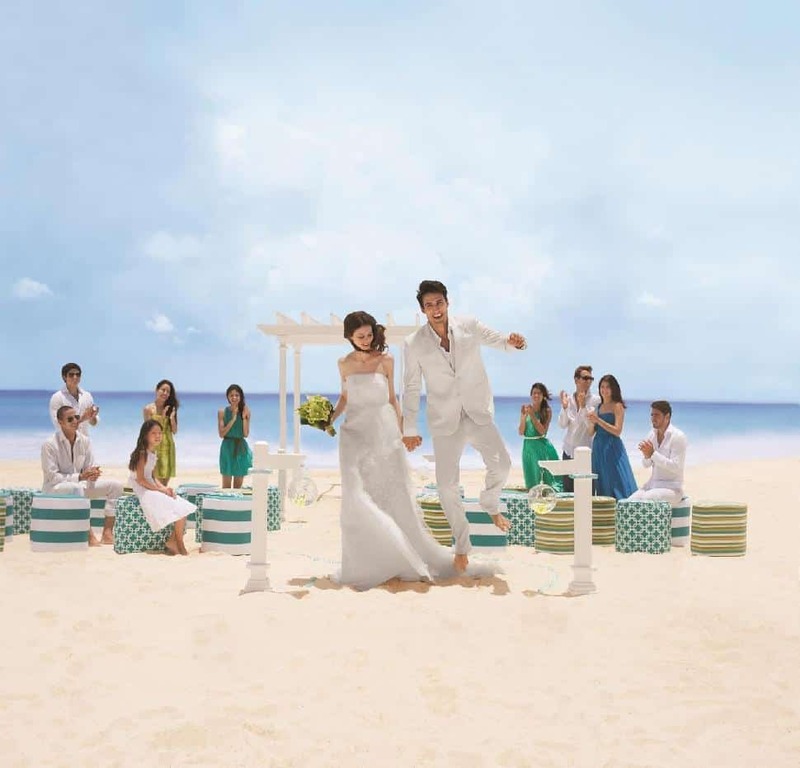 The Dreams Wedding in Paradise package is $999 USD or complimentary with specific details. The Dreams of Love wedding package is $2,799 USD for 2016, or $2,499 if you book August to October. This package will be $3,199 USD in 2017, or $2,799 USD if you book between August and October. The Dreams Ultimate Wedding package costs $3,299 USD for 2016, or $2,999 USD if you book between August and October. It’ll cost $3,599 USD in 2017, or $3,299 USD if you book between August and October. Hotel description: Set along the Sea of Cortez and surrounded by eight championship golf courses, Dreams Los Cabos Suites Golf Resort & Spa shows off the beauty and elegance of traditional, colonial Mexican design. There are 230 rooms at this resort, and three pools – including an infinity pool, a kid’s pool and an adults-only pool. Location: Los Cabos, 25 minutes from the airport. Hotel description: Set amongst lush jungle, soaring mountains, dazzling coral reefs and the picturesque Tangolunda Bay, Dreams Huatulco Resort & Spa is a sanctuary of leisure and adventure. It's the perfect setting for a wedding, honeymoon, romantic getaway or family vacation. There are 421 rooms at this resort, and six pools. Location: Huatulco, 25 minutes from the airport. Hotel description: Get away from it all in luxury and style at Gran Caribe – enjoy the stretch of pristine, white sand beach, stunning blue ocean views, explore the cultural heritage of the region and the entertainment district, and don’t forget to spend some time at the Gran Caribe Oki Splash Water Park! There are 465 rooms at this resort, and two pools. Wedding information: Get married in a romantic gazebo, a chapel, in the garden or on the beach under a flowered canopy. Wedding packages include a complimentary wedding with a six-night stay and go to over $3,500, depending on the package you’re looking for. Hotel description: This all-inclusive, adults-only resort offers an oasis set along an untouched peninsula between the Caribbean and the wetlands preserve. You’ll find two miles of white sand beaches, and you’ll only be minutes away from the entertaining nightlife of Cancun. There are 450 rooms at this resort and seven pools. Location: Playa Mujeres, 30 minutes from the Cancun airport. Wedding information: Wedding packages range from $850 USD to $2,400 USD, depending on the services you’re looking for. Get married in a romantic gazebo, or on the stunning beach loverlooking the ocean. Hotel description: This adults-only luxury resort takes all-inclusive to a new level. This resort matches modern beauty with the natural wonders of its Mexican surroundings, and every detail will be taken care of so you can relax and enjoy your stay. There are 420 rooms at this resort, four pools and butler service. Wedding information: There are several wedding packages to choose from, so it’s easy to have the wedding of your dreams. Get married to the sound of the ocean—on the beach, terrace or wherever your heart desires. 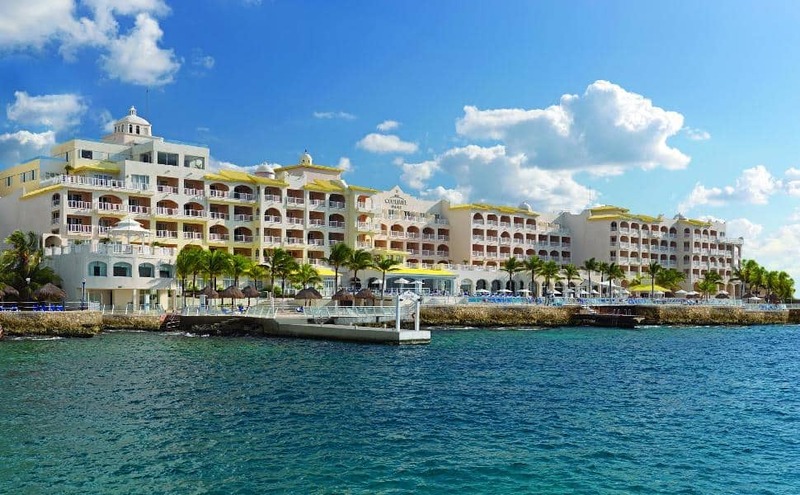 Hotel description: Located on the beautiful island of Cozumel, overlooking the Mexican Caribbean Sea is Allegro Cozumel. This family friendly Cozumel all-inclusive vacation resort is about 20 minutes from the international airport and a 45 minute ferry ride from Playa del Carmen, Mexico. The nearby Palancar Reef is considered one of the top 5 dive destinations in the world while guests staying at Allegro Cozumel can also enjoy one of the best beaches the island has to offer. There are 305 rooms at this resort, and three pools. Location: Cozumel, 20 minutes from the airport. Wedding information: Get married on a beautiful, white sand beach or take advantage of your location and get married underwater. There are several packages to choose from, allowing you to customize your day and make your dreams come true. Hotel description: This new, adults-only hotel offers Unlimited Luxury for its guests. Located on Medano beach, the safest swimmable beach in Cabo San Lucas, you’re also just steps away from the vibrant nightlife and shopping that Cabo San Lucas offers. There are 169 rooms at this resort, as well as an infinity pool. Wedding information: There are three wedding packages available. The First Comes Love package is $999 USD or complimentary with specific details. The Lucky In Love wedding package is $2,799 USD for 2016, or $2,499 if you book August to October. This package will be $3,199 USD in 2017, or $2,799 USD if you book between August and October. The Eat, Drink And Be Married package costs $3,299 USD for 2016, or $2,999 USD if you book between August and October. It’ll cost $3,599 USD in 2017, or $3,299 USD if you book between August and October. Hotel description: Escape to the legendary beaches and azure waters of Bahia de Banderas, in the heart of Riviera Nayarit, Mexico. This luxury, all-inclusive resort offers everything you could want, and is the perfect destination to eat, drink, play and explore. There are 348 rooms at this resort, and three pools. Location: Riviera Nayarit, 30 minutes from the Puerto Vallarta airport. Wedding information: You’ll be wed in oceanfront bliss at the Hard Rock Hotel Vallarta, either on the beach, the terrace, in the ballroom, by the pool or in the garden. There are several packages and options to choose from, so you can customize your day and make it just right. Hard Rock offers a complimentary base package, and from there you can upgrade or include other add-ons. Upgrade to a Colin Cowie wedding collection, starting at $1,5000 USD, which includes additional décor and other beautiful touches. You can host a one-hour private cocktail party after the ceremony, which is charged per guest; you can choose to host a private reception with all the fixings, as well as hire a photographer to capture your day. Hotel description: This all-inclusive resort offers modern and spacious one to four-bedroom residences for its guests, unlimited gourmet a la carte dining experiences, free tours, golf, a VIP beach club and so much more. There are 169 residences available and two pools. Wedding information: Marival Residences Luxury Resort offers a complimentary wedding package that includes up to 30 guests. 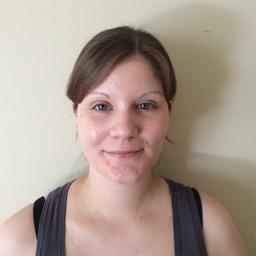 Extras, such as music, photography and flowers, are additional costs. Hotel description: Ixtapa is a destination that gets you away from it all, offering modern luxury with a small-town feel. There are 203 rooms at this resort, and a pool. Indulge in the resort’s fine restaurants or book an adventure and go exploring. Location: Ixtapa, 25 minutes from the Zihuatanejo airport. 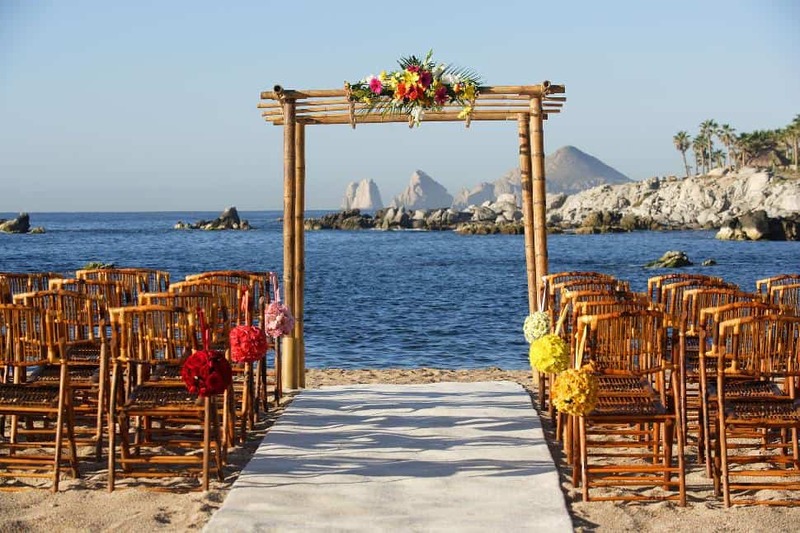 Wedding information: Get married on the beach, in the garden or have a religious ceremony at a local church. Tesoro Ixtapa offers several package options, meaning you can get the day you’ve always dreamed of. 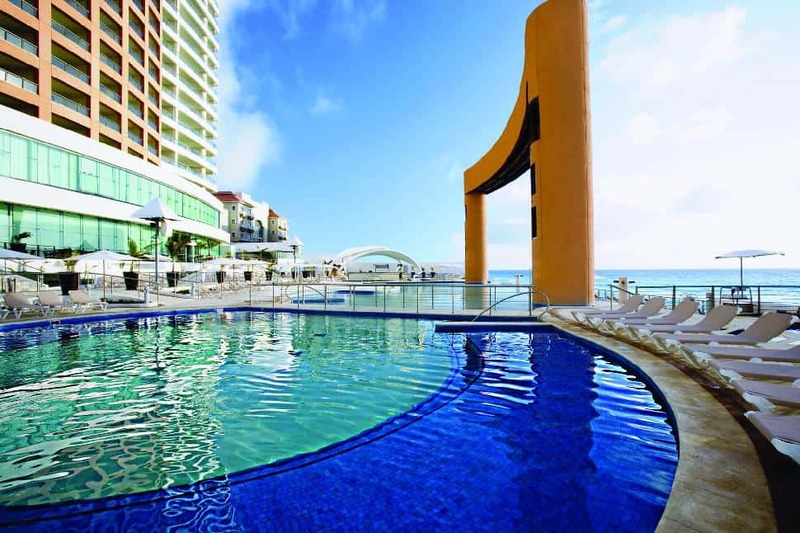 Hotel description: The Golden Parnassus All Inclusive Resort & Spa is an adults-only resort with an exceptional location in the unexplored beach between Nichupte Lagoon and the Caribbean Sea. There’s plenty to see and do here, and the resort boasts 214 rooms and a pool for your enjoyment. Location: Cancun, 25 minutes from the airport. Wedding information: Get married on a beautiful beach, surrounded by lush gardens and the ocean. 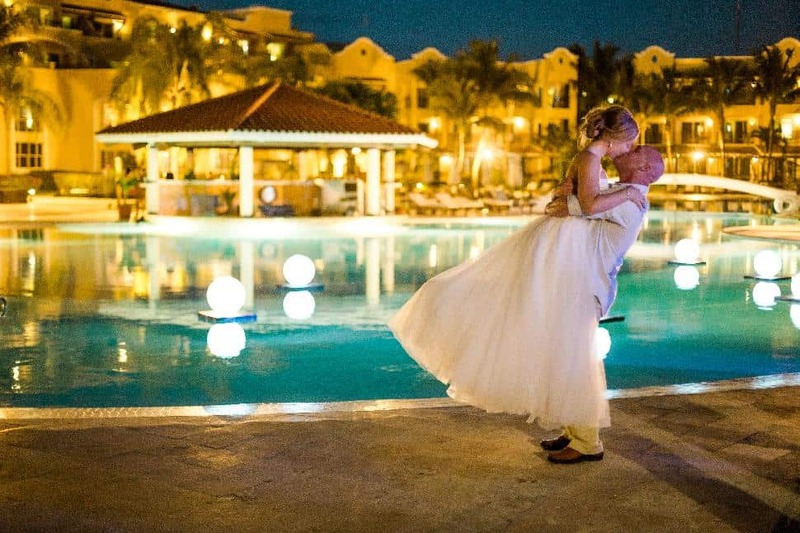 This resort offers several packages for you to make this your dream wedding for a great price. Hotel description: Tucked within an ecological and historical preserve, the Cancun Riviera Maya all-inclusive resort Occidental Grand Xcaret captivates guests with spectacular grounds, a pristine coastline and unparalleled service and amenities. This Riviera Maya resort is located adjacent to the spectacular, breathtaking natural wonder of the eco-archeological Xcaret Park in the heart of Riviera Maya, minutes from Cancun and renowned Playa del Carmen. Location: Xcaret, 75 minutes from the Cancun airport and 15 minutes from Playa del Carmen. Wedding information: Say your vows to the sound of the waves and take in the breathtaking beauty all around you. Occidental Grand Xcaret offers several package options. Hotel description: The Fairmont Mayakoba sits on 240 acres of tropical forest, surrounded by the white sand beaches of the Caribbean. Each suite features a private entrance, spa-like bathrooms and views of the tropical forest, the gardens or the azure sea. During your stay, be sure to experience some of the many adventures you can go on, such as exploring nature trails on foot or by bike, scenic boat tours, non-motorized water sports, dine at one of four restaurants, spend some time at the spa, and so much more. You won’t run short of things to see and do at Fairmont Mayakoba. There are five pools available for your pleasure, and 401 rooms at this resort. Wedding information: Book your wedding at Fairmont Mayakoba and watch your dreams come true. Get married on the beach, in the lush gardens, in the outstanding ballroom, or anywhere your heart desires. The resort offers several package options, catering to every bride, every style and every wedding wish. Hotel description: The Generations Riviera Maya is touted as the quintessential family resort, offering something for everyone and all ages. Dine on fabulous food in the Gourmet Tower, featuring four Gourmet Inclusive restaurants with 180-degree views of the Caribbean Sea. Afterwards, dive into your balcony infinity pool. The Eko Kids Club offers supervised activities for kids, so parents can have time to themselves. And there’s plenty for them to do! This resort offers two pools and 144 suites. There are 16 restaurants all together, 11 bars and one spa. Wedding information: There are three wedding packages you can choose from, with the most expensive at $7,985 USD. The options allow the bride and groom to customize their day and get the most from their destination wedding experience. Your wedding will be high end, luxurious and you’ll dine on divine meals. Hotel description: This family-friendly, Gourmet Inclusive resort is perfect for everyone – families with kids from tots to teens, couples, groups, honeymooners and soon-to-be-married couples. But with so much to see and do, the resort hasn’t forgotten the luxury accommodations and outstanding service they know their guests want. This resort offers 480 suites, five pools, nine restaurants, six bars and one spa. 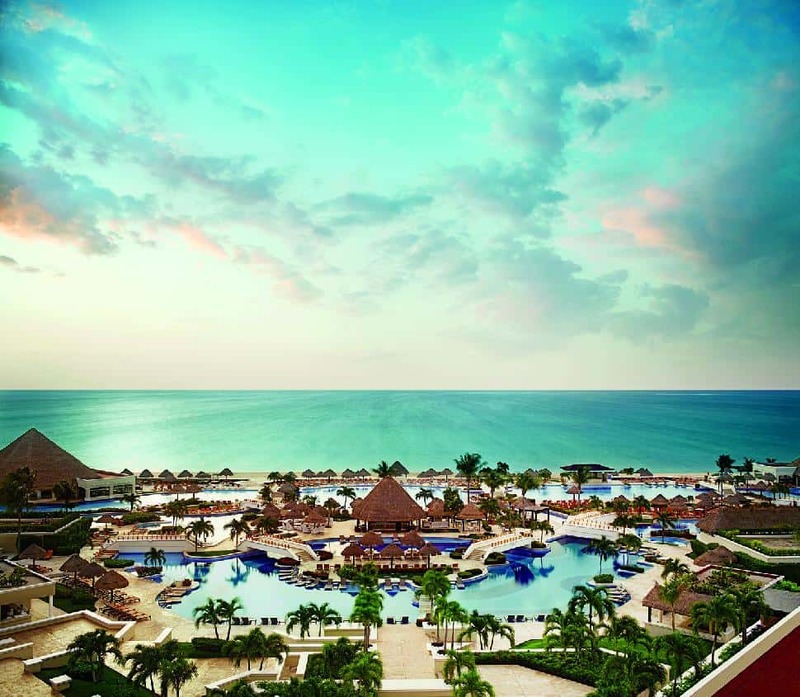 Hotel description: The Hotel Valentin Imperial Maya is the definition of paradise. Inspired by grand haciendas of the past, this adults-only, all-inclusive resort offers unsurpassed luxury and beauty. Set amid lavish gardens on a half-mile-long stretch of white sand beach named Playa Del Secreto (The Secret Beach), this magnificent award-winning resort boasts one of the largest swimming pools in México and a second giant pool for you to enjoy. This resort offers 540 rooms, eight restaurants and 11 bars to spoil yourself, with unlimited drinks wherever you go. Wedding information: There are several wedding packages to choose from, with the most expensive option at $5,171 USD. 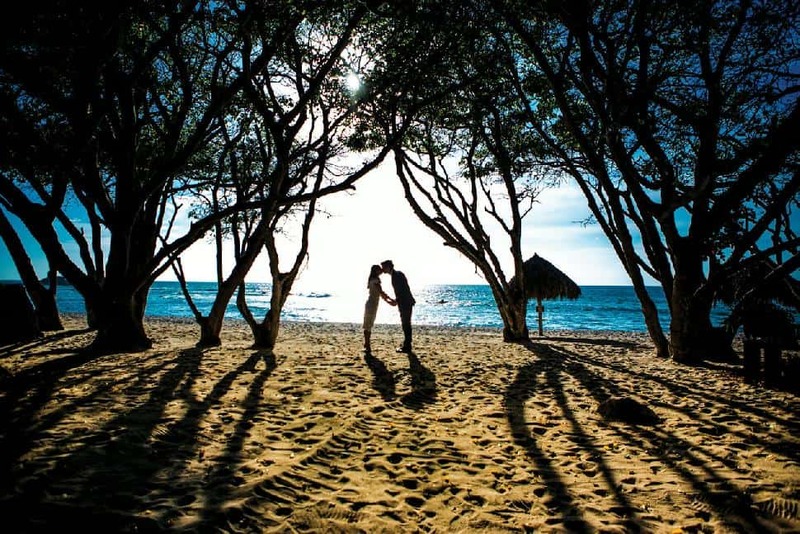 Get married on the beach, in the lush gardens, in a chapel or inside the hotel. All of the details are looked after for your magical day. Hotel description: The Paradisus Playa Del Carmen La Perla offers the finest in luxury and exclusivity. This adults-only resort will take your breath away with its views, accommodations and world-class facilities. The resort is set close to archeological treasures like Tulum, Chichen Itza and Coba, giving you the best in off-site adventures. Once you’re back at the resort, there are 14 restaurants and 16 bars to explore, as well as two pools. The Paradisus Playa Del Carmen La Perla was named a Travelers’ Choice 2014 winner by Trip Advisor, and it’s easy to see why! 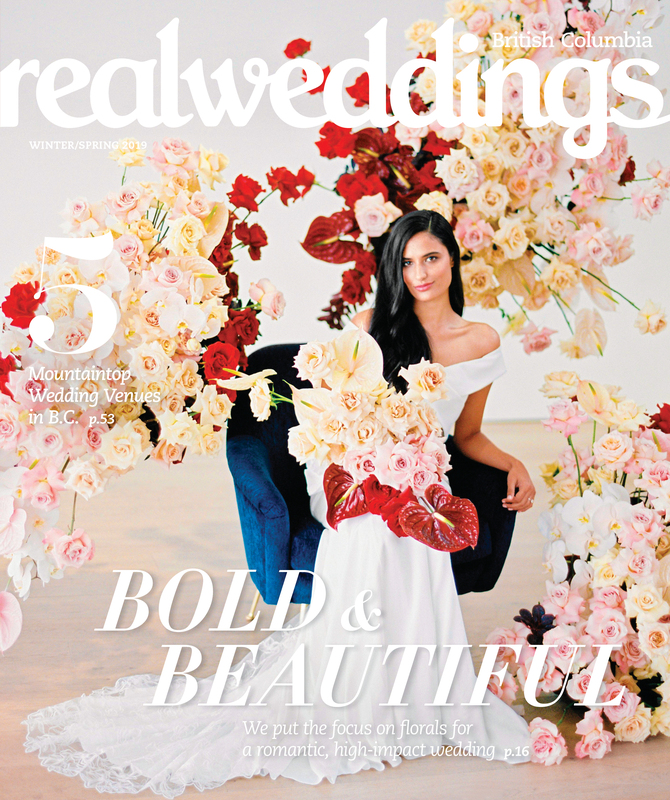 Wedding information: There are several wedding packages to choose from, and this means you can have your special day just the way you’ve always imagined it. With stunning, white sand beaches and lush surroundings, it’ll be a day you’ll never forget. Hotel description: Swim, golf, pamper yourself and have an amazing time at this all-inclusive resort. Kids stay free and you can choose from several different activities to make your stay even more wonderful. You’ll only be a kilometre from the beach, 12 kilometres from Wet’n Wild Cancun and 17 kilometres from the Croco Cun Zoo. This hotel has 2,476 rooms and eight pools. Location: Riviera Maya, 30 minutes from Cancun airport. Wedding information: Your options for a beautiful ceremony include: chapel garden, gazebo, terrace, ballroom, on the beach or in the chapel. Wedding packages include: Compliments of Palace Resorts with a minimum three-night stay; Nautical: $1,500 USD; Romantic Red: $2,000 USD; Metallic Sands: $2,500 USD; Exotic Peacock: $3,000 USD; Pearl Shimmer: $3,500 USD; Lavender Luxe: $3,900 USD; Sultry Sunset: $4,200 USD; Pure: $4,500 USD; Chapel: $2,115 USD. Hotel description: Dine on Michelin-starred cuisine from Jean-Georges Vongerichten at his steak and seafood restaurant or on sushi and ceviches at his other venue; enjoy Mexican farm-to-table cuisine from powerhouse chef Larbi Dahrouch. Soak your cares away at One&Only Spa, explore the Sea of Cortez with snorkeling or scuba diving adventures, try your hand at sport fishing, swim in the ocean or bask in the luxury of the resort. There’s so much more to do, you won’t be bored or lacking in spectacular opulence at the One&Only Palmilla. There are 115 rooms at this resort and two ocean-view infinity pools – one for families and one for adults only. Wedding information: Get married in a historic chapel, on the beach, in the resort’s stunning herb garden or in the conference courtyard. Hotel description: The Grand Palladium Vallarta Resort & Spa is situated along Banderas Bay, in the natural beauty of Riviera Nayarit and it’s lush vegetation, offering beautiful beaches, transparent water and unrivaled sunsets. You’ll find a variety of activities waiting for you and facilities that cater to guests of all ages. There are 419 rooms at this resort and three pools. Location: Puerto Vallarta, 40 minutes from the airport. Wedding information: Get married on the beach, on a terrace overlooking the ocean or in a historic colonial church. There are several packages to choose from, so you can customize your day to your liking. Prices range from $850 USD to $4,000 USD. Hotel description: This adult-only, beachfront resort is located on a stunning island off the coast of Mexico. Enjoy dinner in an open-air restaurant, dive amongst the Garrafon Natural Reef Park or travel to the Mayan ruins at the El Meco archeological site. There are 62 rooms at this resort and one pool. Location: Isla Mujeres, 50 minutes from the Cancun airport and a 20-minute ferry to the island. Wedding information: Get married on the beach, on one of two terraces, in the hammock/relaxing area or in the pool area.Wedding packages include: Compliments of Palace Resorts with a minimum three-night stay; Nautical: $1,500 USD; Exotic Peacock: $3,000 USD; Sultry Sunset: $4,200 USD. Hotel description: If water sports are your passion, Cozumel Palace is the place to be. Go scuba diving, take in a romantic dinner and enjoy the views from this beachside resort. There are 169 rooms at this resort and two pools, including an infinity pool. Location: Cozumel, 10 minutes from the Cozumel airport. Wedding information: Get married on the beach, on a rooftop terrace overlooking the ocean or in a ballroom. Cozumel is a beautiful island off the coast of Mexico – a premier destination if you want a true island wedding. Wedding packages include: Compliments of Palace Resorts with a minimum three-night stay; Romantic Red: $2,000 USD; Exotic Peacock: $3,000 USD; Pure: $4,500 USD. Hotel description: Cozumel is a beautiful island off the coast of Mexico – you’ll experience the luxury and beauty offered with a Mexican getaway, but with a true island feel. Dine, lounge by the pool, explore the Caribbean on a scuba diving tour, take in an open-air show at the theatre, go golfing or attend a turtle-nesting workshop. There’s so much to see and do, and all the luxury you could want right at your fingertips. There are 238 rooms at this resort, and three pools. Wedding information: Get married on the beach or in an eye-catching gazebo, and then host your guests for a reception on the beach, in the ballroom or on the terrace. Cozumel is an island off the coast of Mexico, and if you’re looking for a true island wedding, consider getting married underwater! Wedding packages consist of complimentary when booking requirements are met (or $999 USD); the Secrets of Love package is $2,799 USD for 2016 and $3,199 USD for 2017, but receive $300 off the 2016 price or $400 off the 2017 price if booking between August and October; the Secrets Ultimate package is $3,299 USD for 2016 and $3,599 USD for 2017, but receive $300 off either price when booking between August and October. To get married underwater is $2,159 USD. Hotel description: You won’t find another property like Verana anywhere in Mexico. This handcrafted resort was built into the jungle and grew from the imagination, starting with one house and eventually ending up with 10 houses for guests to enjoy. Indulge in the spa or the gourmet food, discover the nearby waterfalls – by foot or by horse – and take a boat to explore the islands and ocean surrounding the resort. You can also take a chartered fishing adventure or relax on the beach. There are 10 houses to choose from, including a bungalow, a studio, a jungle suite and more, as well as a pool. Location: Yelapa – take a taxi from Puerto Vallarta to Boca de Tomatlan and then catch a boat ride to Yelapa. Wedding information: Wedding facilities range throughout this property, from a beach wedding, to getting married poolside or in the jungle setting. Verana can accommodate up to 36 guests on site, and up to 50 people for the ceremony and dinner. The day rate for the whole property – 10 houses and up to 20 guests, including meals, is $5,480. Any additional guests, up to 36, are an extra $170 each, including meals. This cost is for meals and accommodations only. Verana offers two wedding packages, ranging from $2,900 to $4,200 and this covers just the bride and groom. Hotel description: Old Mexico meets modern design at the Las Brisas Hotel, set into the side of a mountain and surrounded by stunning jungle vegetation. This resort offers an excellent balance between recreation and relaxation. There are 416 rooms at this resort and four pools. Location: Ixtapa, 20 minutes from the Zihuatanejo airport. Wedding information: Wedding facilities include the beach, the garden area or on one of the terraces. Have the jungle or the ocean as your backdrop. The basic wedding package costs $1,350 USD and goes up from there, depending on your wishes. Hotel description: Surround yourself and your guests with lush gardens on the Pacific Coast peninsula. You’ll have direct access to stunning, white sand beaches and many amenities. This resort offers 173 casita-style guest rooms and 31 suites, as well as one solo pool and a pool complex for adults. Location: Punta Mita, about 42 kilometres from the airport. Wedding information: Get married on the beach, on the edge of a cliff with stunning views, at the golf club or in the ballroom. Prices range from $8,000 to $14,500 USD and the approximate guest cost is about $365 USD for a three-course dinner and five hours of open bar. Hotel description: It doesn’t get any more sophisticated and luxurious than the Esperanza. Set between two bluffs on a private with stunning views all around, this resort has everything you could want and you’ll remember it for years to come. A world-renowned, luxury spa, championship golf courses, secluded white sand beach and an exciting nightlife are all for you to enjoy. There are 57 rooms in the resort, 60 privately owned villas and 36 private residences, as well as an adults-only infinity pool and a family-friendly pool near the villas. Wedding information: Get married on the Land’s End Terrace, a cliffside setting overlooking the ocean; the pool terraces; the beach; a seaside terrace; in the lobby; at El Bar or Cocina del Mar. The wedding fee is $2,500 Sunday through Thursday, or $3,500 Friday or Saturday. Hotel description: Set on Mexico’s Yucatan coast, you can take in the views of the Caribbean Sea from your lavish suite. This all-inclusive, all-ages resort offers cuisine from around the world, endless adventures to enjoy, pools, a white sand beach and a chance to let your cares float away on the sea. There are 547 rooms at this resort, and three infinity pools. Wedding information: Get married in a gazebo on the point of the peninsula, in the ballroom or on the rooftop deck. Wedding packages range from complimentary, with a certain number of guests staying at the hotel, up to $11,150 USD. There are several packages to choose from, so you’re sure to find something that fits your needs and budget. Hotel description: The pools, the beach, the food – what more could you want! You’re only a few minutes from the action of downtown Cabo San Lucas. If you'd rather, stay in and enjoy all of the amenities the hotel has to offer. This resort has 250 rooms and three pools, including an adults-only pool. Location: Los Cabos, 45 minutes from the Los Cabos airport and five minutes from Cabo San Lucas. Wedding information: Get married in a mountain setting, overlooking the marina; on the beach; or in the Finisterra garden.